E-Board Members in Attendance: Ken Koscick; President, Cathy Watkins; Vice President Bill Alford, Secretary; Terry Mullally, Christopher Dolciato, George Payangis, Kathy Smith. 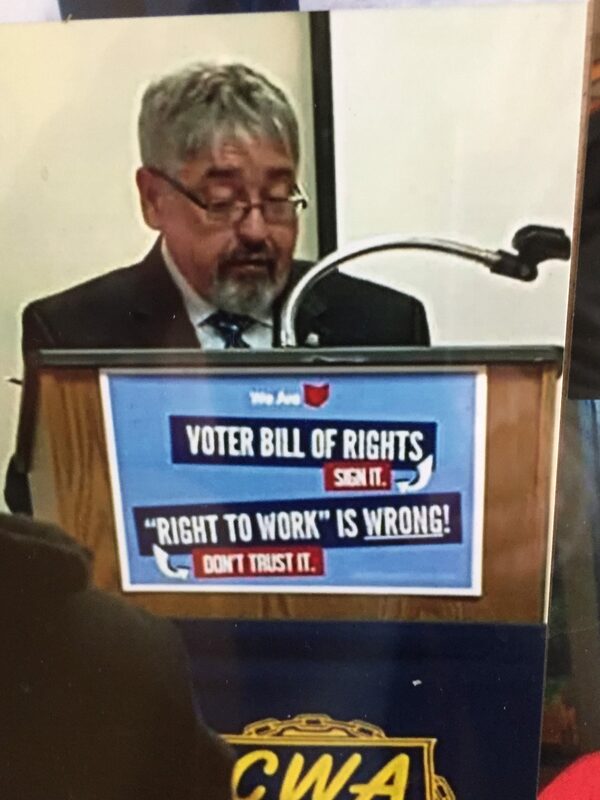 President Koscick asks for a moment of silence to honor former President Wachenshwanz and makes comments about Bill, his life and his service to the Union. President Koscick talked about the succession to President and Vice President per the bylaws after Bills passing. President Koscick asks for the memberships help with filling Union board positions in upcoming elections. Vice President and Secretary terms are up this year. Cathy Watkins was appointed as Vice President to finish Ken’s term as Vice President. Cathy is sworn in as Vice President. A motion is made C.D. to accept the minutes with changes from 11/17/18 and seconded by C.W.. The motion passes. 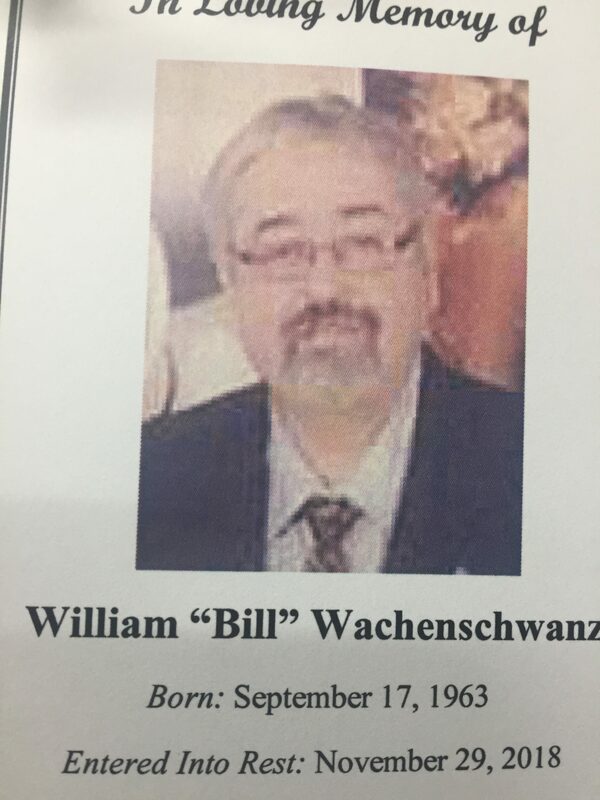 There were some unexpected expenses due to the passing of Bill Wachenshwanz. Some meals for the family were paid during the wake and funeral. The Local will also pay a portion of the headstone. The NABET logo will be on it. Discussion about the salary comp for board members. A motion is made by T.M to accept the Treasurers report for November and December and seconded by K.S.. The motion passes. A motion is made by C.D. and seconded by G.P. to accept the new members. The motion passes. WJW Engineering – Harry Simmons retired. 8 VR’s are gone. The Wachenshwanz family expressed their appreciatation for everything the union has done during their time of need. WKYC- Getting close to the 60 day window for negotiations. The unit is beginning to organize a committee. This is an important contract. WOIO- The members were very appreciative of the gift cards. The new digital studio is allowing non-union people to produce full shows with commercials to web based services. The contract allows for this but members must also trained on the equipment 1 for 1. Negotiating committee has met and came up with a proposal and is being compiled. Gray scheduled a meet and greet with the stewards. It should be a short meeting with no contract issues discussed. Voted on the contract December 7th and lost by a wide margin. Two negotiators resigned. Tshirts will be purchased for the members to wear during negotiations. Two members lost their mothers during Christmas. Flowers were sent to one and a charitable donation to the other. Grievence filed over side letter 5, but denied. AFL-CIO Report – Rick Nagin give a report from the AFL-CIO and comments on the passing of President Wachenshwanz. Suggestion was made to purchase NABET hats for the membership. Open to further discussion. A new regional vice President has been chosen to replace Bill Wachenshwanz and will run for re-election. Anyone in the unit can run for the position. The current term is up June 1st. The next E-Board meeting is February, 2019 at 9:30am. A motion is made to adjourn the meeting by T.M. and seconded by G.P.. Motion passes. 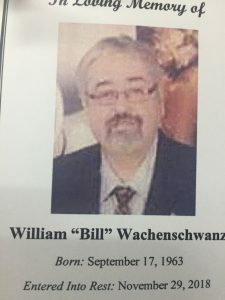 Local 42 lost our beloved President, Bill Wachenschwanz on November 29, 2018. Bill was a kind, compassionate, fair man who loved his family and the union he represented. He was a tireless, loyal friend. A fighter for all who labor. who will be missed greatly. Rest in peace, Bill. Thank you from all of us. Called to order at 9:45am by VP Ken Koscick with Bill on the phone. Guests: Harriet Applegate & Rick Nagle. Guest speaker Harriet Applegate from N. Shore AFl-CIO talked about members helping with phone banks or canvasing neighborhoods for November elections. Minutes: Waved reading of minutes from last meeting by Christopher Dolciato second by Kathy Smith motion PASSED. Treasurer’s report: No treasure’s report. New Members: Andrew Robinson (WJW). Leaving Members: Michael Friend (WJW), Ken Scheck (WJW). Correspondence: Thank you note from Ed Louloudis (WOIO/WUAB). 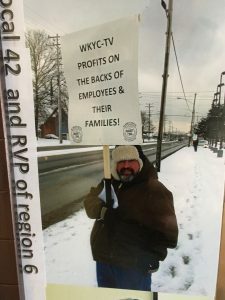 (WJW News) has a new Tentative agreement for 2 years because of sale. Not much changed, tighten some items, prompter and sick days. (WJW Engineering) Kathy Smith and Terry Mullally will be back as temporary “acting stewards” until further notice. Motion by Christopher Dolciato second by Steven Parsons. Motion PASSED. Negotations are going slowly. Working without a contract since November 2017. Trying for three more meeting dates. Arbitration filed for Jib camera work that did not end in our favor. IA is training. (WOIO/WUAB) WUAB celebrating 50 years today. Contract is coming up but we are unsure if we are negotiating with Raycom or Gray Media. Some of our members have PSC that are expiring, and the company is trying to force them into signing or they will be let go. If a PSC expires they would fall under our contract. Motion made not to exceed $800 for food and other items for the general member meeting on Saturday, October 27 by Kathy Smith seconded by Brian Geiger. Motion Passed. Announcement: Union members are encouraged to see The Cleveland Playhouse performance of “Sweat” on Sunday, October 14. Next E-Board meeting will be Saturday, October 27 at 9:30am followed by the General Membership at 11:00am. Motion to adjourn the meeting by Brian Geiger and seconded by Kathy Smith. Motion PASSED. Meeting adjourned at 11:07am. Respectively summitted by Christopher Dolciato.